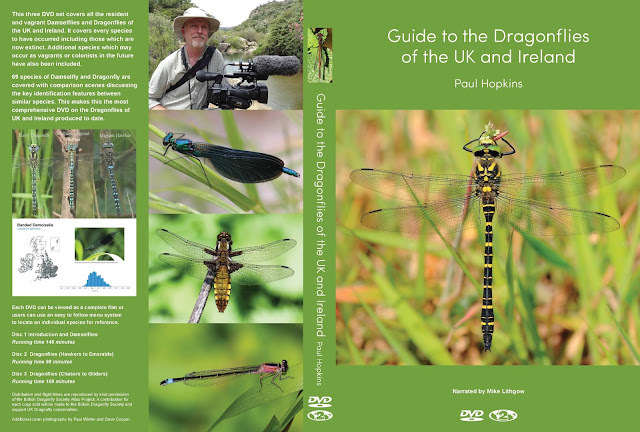 I am pleased to say that my 3 dvd set on the Dragonflies of the UK and Ireland is now complete. This is the culmination of 9 years of of field trips gathering the necessary footage required. 69 species of Damselfly and Dragonfly are covered with comparison scenes discussing the key identification features between similar species. This makes this the most comprehensive DVD on the Dragonflies of the UK and Ireland produced to date. I have also included footage of a 70th species, the Violet Dropwing Trithemis annulata as this beautiful Dragonfly is rapidly expanding it's range from the Mediterranean and progressing northwards through France so may one day reach our shores. This dvd caters for all levels of Dragonfly enthusiast. It can be used as as an introduction to the family groups, learning the common species or getting to grips with the identification features of potential vagrants. Want to know the key differences between Common and Azure Damselfly or curious about what the Blue Dasher that was found on a Shetland oil rig actually looks like, it's all on this dvd. This three dvd set retails at £35 and contains 353 minutes of comprehensive footage, distribution and flight data. A donation will be made to the British Dragonfly Society for each copy sold. The dvd format is PAL region 2 for Europe. If purchasing from outside of Europe please make sure your dvd player is multi-region enabled. To order a copy of the this title, simply press the dvd's for sale tab at the top of this page which will take you a separate page where it may be purchased.